Documentarist Kawase Naomi's first feature film set in the mountainous Nishiyoshino region of Nara Prefecture depicts the life of a family consisting of Tahara Kouzou, his mother Sachiko, wife Yasuyo, daughter Michiru and his nephew Eisuke. In an attempt to revive the small village's economy, a railroad project is started planned by Kouzou. When the project is cancelled Kouzou falls into depression and the family struggles getting through. 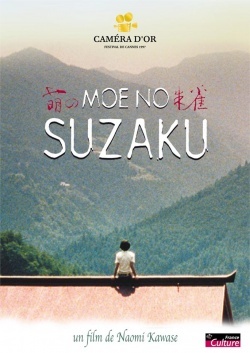 Although Moe no Suzaku is a fictional story, Kawase has used some documentary techniques. The real town has lost many of its population, and also contains a partially completed tunnel. Kawase visited the town for years before making the film, and was helped during shooting by local people. Kawase also renovated an old farmhouse to act as the main set. The film does not depend heavily on plot, drawing its strength from a highly aesthetic style and some compassionate portrayals of the characters, who seem unable to express themselves and their feelings.